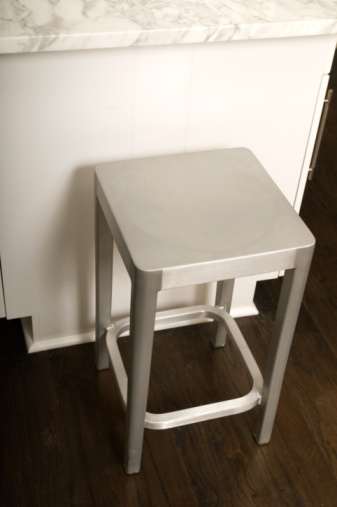 Metal furniture can rust whether it is used indoors or outdoors. Take the piece of furniture outside on a sunny, dry day. Remove any cushions or fabric covers. Fill a 5-gallon bucket with warm water. Add 3 tablespoons of liquid dishwashing soap. Dip a nylon scrub brush into the warm, soapy water and scrub the entire surface of the piece of furniture. Dip an old toothbrush into the water and use it to scrub any grooves or corners that the larger brush could not reach. Rinse the piece of furniture with clean water from a garden hose. If there are unremovable pieces of fabric on the piece, rinse out a sponge and run the damp sponge over the fabric to remove any dust or dirt. Wipe the furniture dry with a towel. Remove any rust spots by scrubbing them with a wire brush until all of the rust flakes off. Spray the bare spots where the rust was with a spray-on metal primer. Allow the primer to dry according to the package directions. Once it dries, you can paint over it or leave it as it is. Replace any cushions or fabric covers and take the piece back inside. Apply a coat of liquid or solid car body wax to the metal parts of the furniture. Follow the package directions for application instructions.